is an Albanian children's TV channel for 1–14 years olds. It was launched on December 17, 2004 by the TV platform Digitalb. Bang Bang airs programming in Albanian, and the original language (of dubbing) on the second audio track. 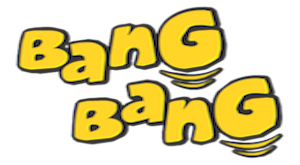 It also airs bumpers and promos featuring its mascot, a yellow monkey combined, using the word 'bang'. However, the channel airs very few commercials that may only show up after the TV programs or movies. While Junior TV, Disney Channel and BabyTV are all sister channels available on the Telekomanda flyBABY TV remote, Çufo is its main sister channel, sharing its dubs and promos about upcoming content with each other. All of the channel's content is in Albanian, which are dubbed by different dubbing studios, mainly "Jess" Discographic, "AA" Film Company and occasionally NGS Recording. There are also dubs provided by Top Channel, Albatrade Studio, and Albania Production (Studio Unison). The channel also has a rating system, which is divided into 3 groups; babies 1–5 years old, kids 6–9 years old, and teenagers 11–14 years old.